Tom McConville | The Goose Is Out! We were delighted to be welcoming Tom McConville to The Old Nun’s Head, and even more delighted when he unexpectedly turned up with guitarist David Newey! 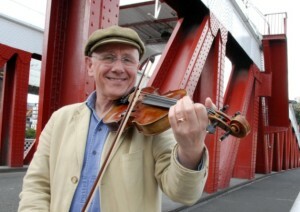 Tom McConville is an absolutely fantastic fiddler from Newcastle who has influenced many other fiddlers including Seth Lakeman. In 2009, Tom very deservedly won “Musician of the Year” at the BBC Folk Awards. Click here to go to Tom McConville’s website!